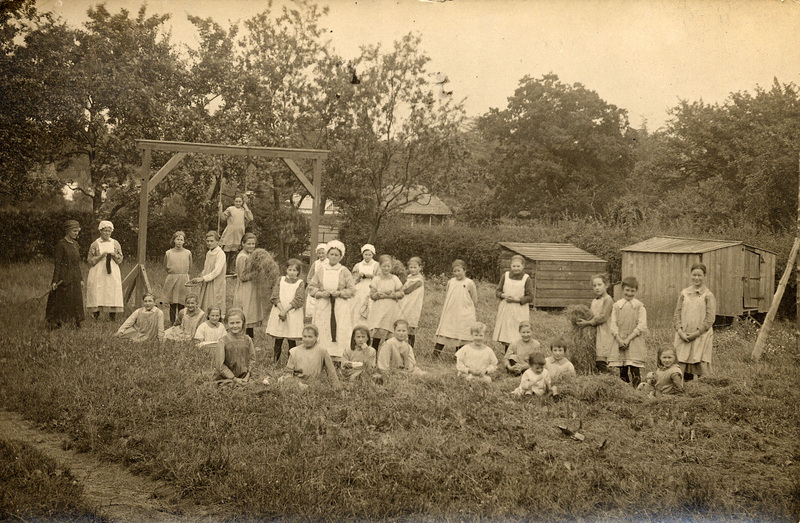 Today we have the first in a series of blogs that take a more detailed look at the history of The Children’s Society’s former children’s homes and social work projects since 1881; here we look at the Eastnor Children’s Home, Herefordshire. St Mary’s Home for Young Girls, Eastnor, was given to the Waifs and Strays Society (as The Children’s Society was known until 1946) on 1st June 1900 by Lady Henry Somerset of Eastnor Castle. As a report in the September 1900 edition of the Society’s former supporter magazine Our Waifs and Strays noted, she did this ‘with characteristic philanthropy’. She had originally established the home in 1884 as a memorial to her father, as she felt that “when she lost her father, she was anxious to build something to his memory, and she felt very strongly that to build up lives was almost better than to build up any other memorial”. The home was opened to provide accommodation for 20 girls aged between 8 and 15 years. In 1904, it was decided to increase the number to 30, taking girls from infancy to the age of 15. It remained a girls home until 1947 when it became a ‘mixed home’ under The Children’s Society’s new policy of establishing joint homes for boys and girls – a revolutionary move that the Society advocated in its post Second World War drive to help break down the barriers of traditional concepts of child care that had persisted since the Victorian era. It remained a family home until 1981 when it began to work with teenagers who had behavioural problems caused by distressing circumstances either in their family life or from previous care experiences. The home was closed by the Society in 1983. All of the children at the home attended the local school and Sunday School. In October 1900 their conduct at school was noted as being “on the whole has been extremely good”. In 1903 the home’s management committee decided to appoint a laundry matron on a salary of ‘£18 or £20′. She was to be responsible for doing the home’s own laundry and taking in laundry from elsewhere to allow the home to earn some additional income. The aim was also to allow the “girls to be taught laundry work”. This training work was expanded to include basket work and needlework; at an event at Eastnor in 1921, a report noted that “the girls have been taking up basket-work keenly, and had on exhibition and sale some excellent samples of Indian weaving: there was also a wide range of capital needlework”. 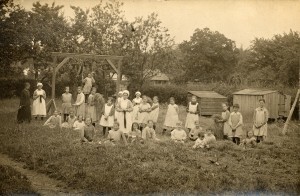 Part of life for many of the Society homes was the eagerly awaited school summer holiday. St Mary’s, Eastnor, was no exception to this rule. Among the many things the girls did during the holiday in 1917 was to spend three weeks helping a local farmer with his work, for which they were paid £7 7s 6d. In 1920 the girls at Eastnor swapped places with the Society’s Worcester Girls’ Home for a fortnight’s holiday during the summer. By the 1950s the children were given individual holidays with either local people or their own parents or relations. In 1973 a number of children from St Mary’s went on a caravan holiday to Devon, with the children sharing a number of caravans. There were a number of outings to a football match, a visit to Paignton Zoo, and a boat ride to Brixham. Christmas was always a key feature in the life of the home and generated plenty of excitement. A timeless comment was made in 1917 in Our Waifs and Strays by one of the girls from Eastnor, “At Christmas, this time being very exciting, we have great fun in the Home, making almost as much noise as we like”. This was mirrored by a report in Gateway in 1978 by a girl at St Mary’s, “About 4am we wake up and scramble out of bed, bleary-eyed and half asleep. then the discovery of the sacks of toys, which are dragged with great force and speed back to our beds. Within minutes the contents are spread out on our counterpanes. By this time everyone is awake, no matter where they hide the sacks, we always find them. The home also had its own Girl Guide troop. The Home Committee on 13th July 1922 decided that “girls of 11 years old and upwards in the home should be allowed to join the girl guides”. In 1927 the Eastnor Home Guides won the ‘Verdin Cup’ for singing at a competition judged by the organist of Hereford Cathedral. The Guide troop and the later addition of a Brownie pack remained an integral part of the home until the 1970s. Up until the Second World War no Society home would have been complete without its annual Pound Day. This fundraising idea, peculiar to the Society, was designed to allow local people to donate either pound weights of produce or give £1 in money. 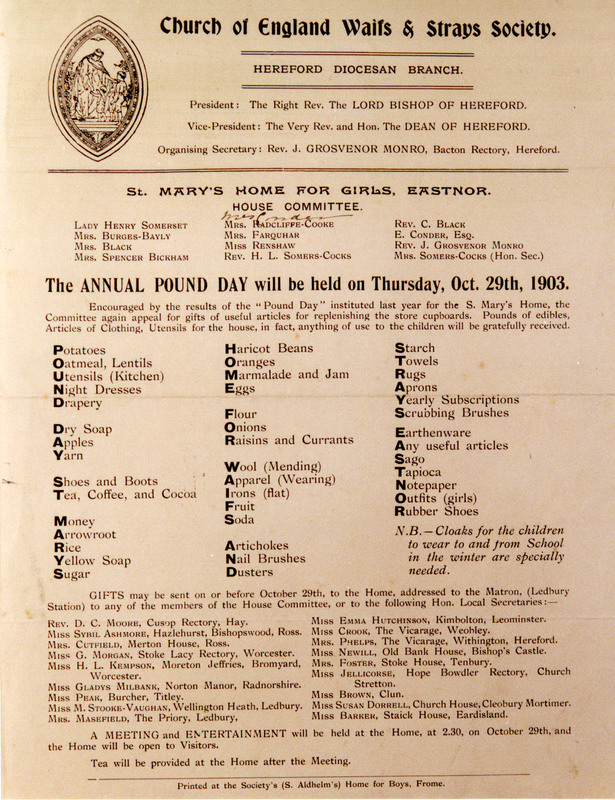 The first Pound Day at Eastnor was held in 1902 and in 1903 the Committee again appealed for “useful articles for replenishing the store cupboards. Pounds of edibles, Articles of Clothing, Utensils for the house, in fact, anything of use to the children will be gratefully be received”. A Pound Day in 1916 brought in 580 lbs of groceries, in addition to large quantities of potatoes, vegetables and fruit. Local people often held events to raise money for the home. Hundreds of fetes and jamborees have been held in honour of the home over the years. In 1920 the Eastnor Wild West Show raised money in Hereford for St Mary’s, as did the local owner of the Severn Steamers Company. In 1969 the Ledbury Round Table paid for the building of a paddling pool in the grounds of the home.